Genuine White Mountain Ice Cream Maker Replacement Parts for both 4 & 6 quart models. Remember the old-time church social, as Grandma's back yard picnic was highlighted by that creamy, cool and delicious dessert? Well, you can still do it... right in your own home, school or church. All you need is your favorite ice cream recipe, ice, rock salt and, of course, your White Mountain Ice Cream Maker! Great for picnics, reunions, or any informal affair. Enjoy smooth, creamy home made ice cream in 20-40 minutes depending on ingredients. Easy to use and clean up all White Mountain Ice Cream Makers include a recipe and instruction book with hints and tested ice cream recipes to insure great tasting old fashioned ice cream every time. If you are not satisfied with any Ice Cream Outlet product you may return it within 30 days for replacement or refund. Why Buy a White Mountain Ice Cream Maker? A White Mountain Ice Cream Maker is constructed of the highest quality woods, and metals. A White Mountain Ice Cream Maker is constructed by hand and factory tested to insure your complete satisfaction. To increase longevity and to protect against salt corrosion the White Mountain Ice Cream Maker uses stainless steel cans and tin elctro plated cast iron. White Mountain Ice Cream Maker tubs are constructed from 5/8 inch select White Pine with galvanized hoops. 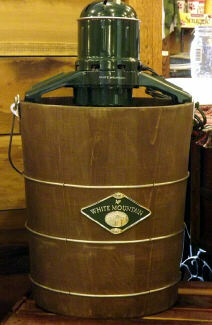 The White Mountain Ice Cream Maker features a Triple motion cast iron three gear drive. This triple motion properly mixes the canister contents resulting in smoother ice cream. The White Mountain Electric Ice Cream Maker features a 12,000 rpm, 115 volt AC motor. White Mountain has been constructing and designing Ice Cream Makers for over 100 years. Their knowledge and expertise allow them to produce some of the finest Ice Cream Makers money can buy. Ice Cream Outlet is independently owned and operated. We are not connected with the Rival Company other than we sell and support their products.